AIkido Black Belt Grading from the Nineties. Michael Holm from the Glaxdale Aikido Club has genrously shared his Shodan (First Degree Black Belt grading) from 1993. What is most striking is not only how much thinner everybody looked back then:-) but also the familiarily of the techniques. Of course there has been evolution in twenty years where flaws have been addressed but everything is still very recognisable. A grading is an opportunity to demonstrate classical technique. It is impossible to train precisely for a real situation as there are so many unknowns. The only thing we can realistically do is to build a framework of principles by studying the martial possibilities of a technique. We must be honest and acknowledge that what we practise in the dojo has to change in a real situation. It is the responsibility of each individual to adapt the technique to their particular scenario. This is really the only way for your practise not to degenerate into a fantasy. A particular enjoyable part of the video is the Yonnigake (four man attack) at the end of the grading. 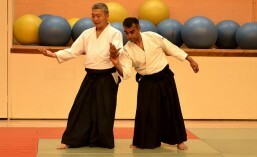 One criticism often cited of Aikido is that the techniques are choreographed. The four man attack, which is a common feature of advanced Aikido gradings, is a simultaneous attack by four individuals where any attack is possible. This is very different to being attacked by four people in sequence as is often seen in the cinema. Here the aim is for the four attackers to coordinate and take advantage of their superior numbers to rush and try to hold the Aikido practitioner down. The best strategy is not to run, or think of just surviving the ordeal. Instead it is better to try to take control and create a situation where the four attackers and the person being attacked are moving harmoniously. Sensei Holm will be teaching in Sweden this weekend giving a seminar in Västerås.